The eight-story, 13,935 m2 (150,000-sf) building houses 114 condominiums with ground-level retail, tenant lounge areas, a courtyard, and a rooftop deck. The $70-million project also included the rehabilitation of the New Mission Theatre, converting it from a one-screen venue to a five-screen, 900-seat theater with a bar. The façade of the building reflects the color and texture of the neighborhood’s Latin-inspired murals and culture, and is scaled with respect to the adjacent buildings’ varied heights and setbacks. The project design includes windows sloped 7 degrees inwards and 7 degrees outwards in alternating columns. Finished in white, the windows provide a neutral contrast to the multicolored, modern exterior. “The weaving, undulating façade is meant to evoke the culture of textiles and craft and also create a sense of movement. The marquee of the theater next to the project is very strong. We favor contemporary design and believe that the best way to highlight historic architecture is to complement it with a modern façade,” said Dean Givas, president of the building’s owning company. Twenty-five-inch vents provide natural ventilation and clean sightlines. Because these systems are manufactured with aluminum, a polyamide insulating strip was prepared for extrusions and inserts. This barrier system improves thermal performance, while maintaining the structural and long-term durability of the fenestration unit. Resin-based architectural coatings and thermal breaks were applied for improved energy performance. The window vent system was engineered to minimize incoming rainwater in case a window is accidentally left open. To successfully weep the vent cavity, a sloped, operable unit capable of draining water away from the building was also created. 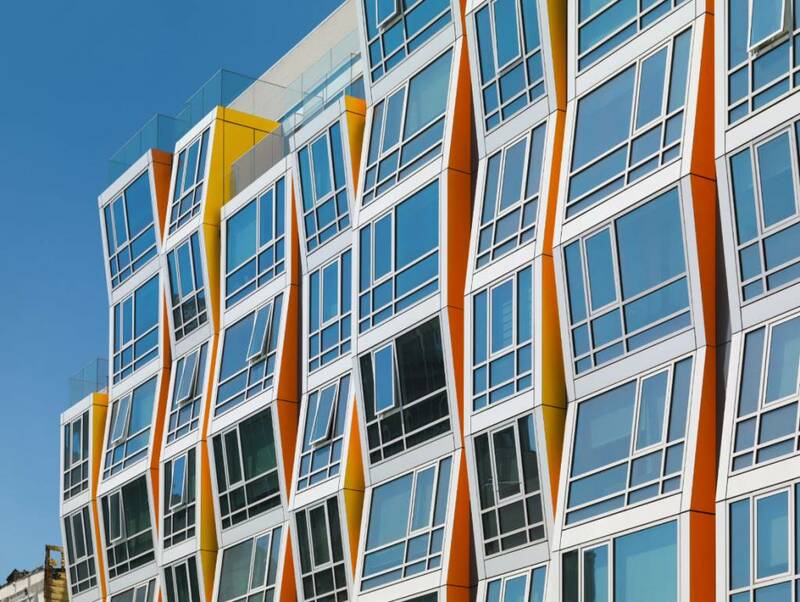 Vida adheres to the California Green Building Standard (CALGreen) and is GreenPoint Rated.